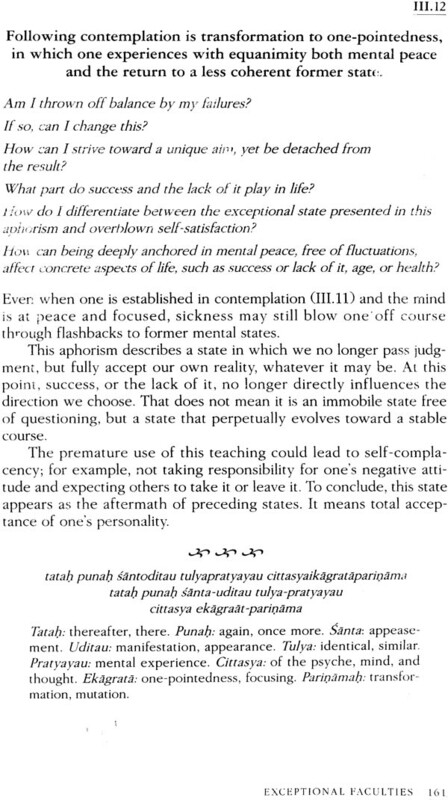 An eloquent translation by a celebrated yoga teacher for every yoga and philosophy student. 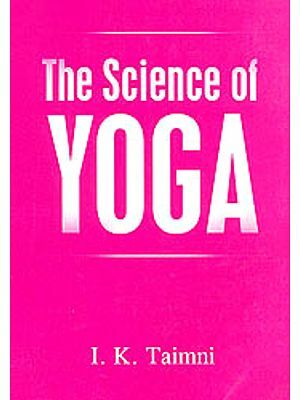 A modern interpretation of yoga's most important text, the essential source of Yoga. 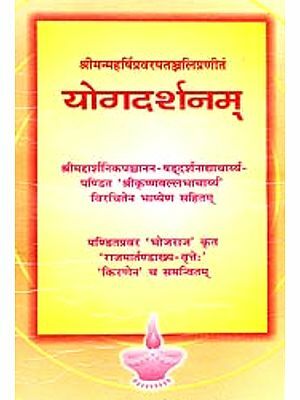 "Bouanchaud offers an invaluable commentary of Patanjali's fundamental text. 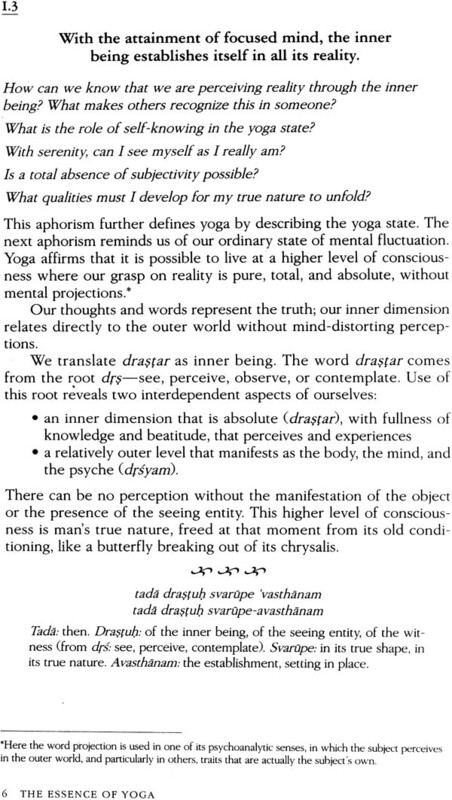 One can not dream of a better and more serious introduction to yoga-practiced and deeply, damandingly understood." - Jean Pierre Jossua, author of The Spiritual Life. Internationally acclaimed yoga instructor Bernard Bouanchaud began studying yoga in 1961. He is the author of several books on yoga including Le Yoga: Premiers Pas. Our great traditions, whose origins are so mystirioUS, have never been obscured by time. This is why they are called eternal teachings. They were the visions of great seers whose pe-rceptions tran- scended time and space. No wonder they continue to inspire us. The Yoga Sutrss of Patafijali are one of these great traditions. One finds in them a profoundly rich view of what this world is all about and how we should relate to it. In a way, the sutras reveal our own true nature. That is why they are called yogs-dersanam-(darsansm means vision). 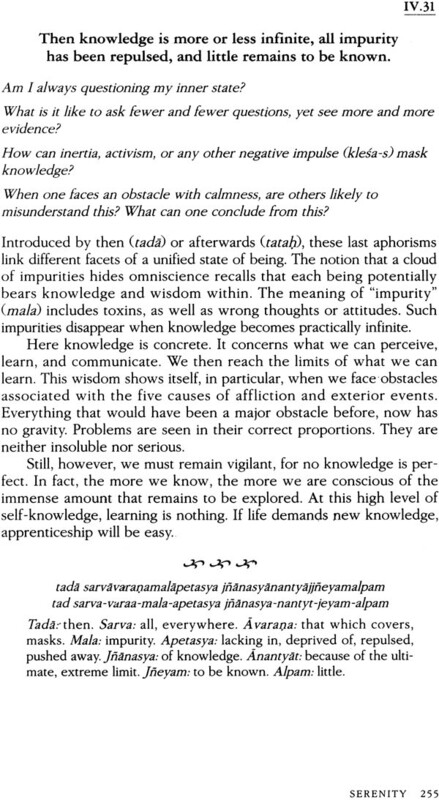 Needless to add, the aspirant can then look for a master with whom to delve deeply into this study and discover one's self. If this. is achieved, then the hard work of Bernard is well rewarded. Long before we detect this precious gem, sheltered from our gaze, the pearl forms slowly in the heart of an oyster. To discover this jewel in the depths and bring it to the surface, a diver may -need to train and prepare for years. So it is with the secret wealth we can find in this ancient text on yoga. It reveals deep riches for those who, through discipline and patience, plumb the depths of the self for the light of universal wis- dom. The Yoga Sturas of Patanjali constitute an authoritative treatise on yoga as a discipline of mind, body, and spirit, a way of wisdom born in India. Its origins are as invisible and mysterious as those of a spring to which we are drawn to quench our thirst for knowledge. Yoga is one of the six classical philosophical systems, or dersenem, of India. One meaning of dersenem is mirror, and as such it is a means of revealing the self. India's sacred texts assert that God was the first yogi; the word Patanjali signifies that with hands harmo- niously curved and joined, we cup them together to catch yoga's wis- dom. 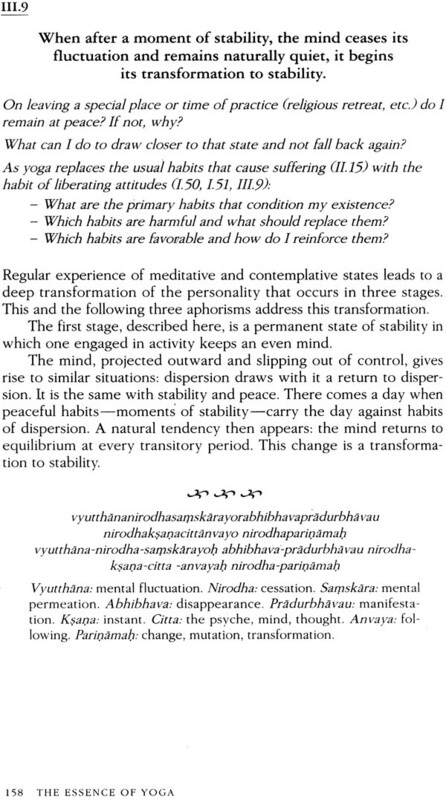 The Yoga Sutras of Patanjali will assist us in this. Recognized by all branches of yoga, its inspiration comes from the Vedas, a collec- tion of very ancients texts that are the foundation of the Hindu spiri- tual tradition. However, the origins of yoga's wisdom are not what really concerns us; rather, we wish to study it seriously and reap its benefits. • One, on medicine, Caraka Samhita, taught us the art of healing. 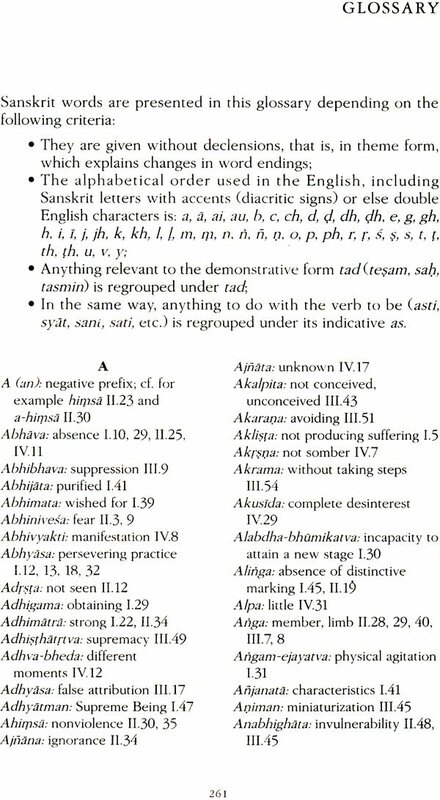 • Another, on grammar, Mahabhasyam, taught us the art of communication. 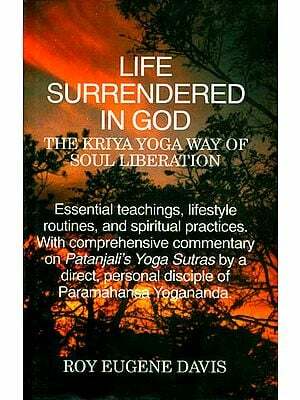 • The third, on yoga, taught us the way to a peaceful mind and spiritual growth. 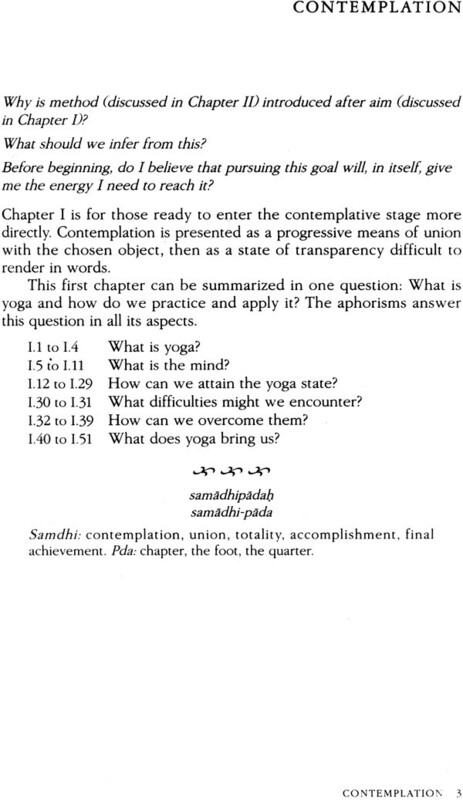 The Yoga Sutras were handed down through oral tradition. Under the master's supervision, a disciple learned the 195 sutras (196 in some schools) by heart. The brevity and simplicity of these sutras, or aphorisms, is a hallmark of oral tradition that allowed perfect memo- rization and pronunciation. This ensured the integrity of the text handed down from generation to generation; it also embodied the spirit of yoga and the need for direct experience of it. Only when the disciple mastered memorization and pronunciation could he begin to question his understanding. These aphorisms provide deep, universal insight into the essential psychological, philosophical, and metaphysical questions we pose. 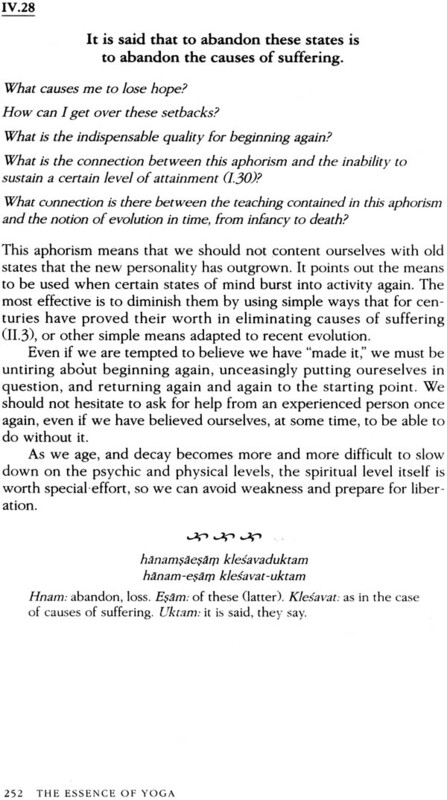 They do not resolve questions concerning the creation and origin of the world, but instead address our understanding of the more imme- diate preoccupations of our essential being: the causes of suffering and how to reduce them. These four chapters correspond to various personal inclinations related to temperament, socio-professional situations, and so on, and this is reflected in the chapter titles. When beginning study of the sutras, the student uses a personal approach based on experience rather than simply following the chronological order of the chapters. 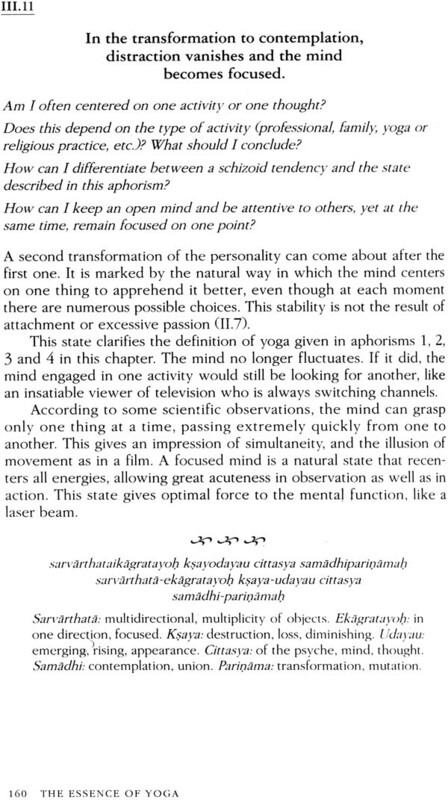 Thus, somebody who is actively employed might start with Chapter II, which discusses day to day dif- ficulties, before studying Chapter I, which presents contemplation as one of the highest aims of yoga. Chapters III and IV examine the higher capacities we can develop through yoga and the highest goal attainable by a human being. As interest in yoga increases in the West, one danger that arises is oversimplification-reducing yoga to a purely physical discipline. 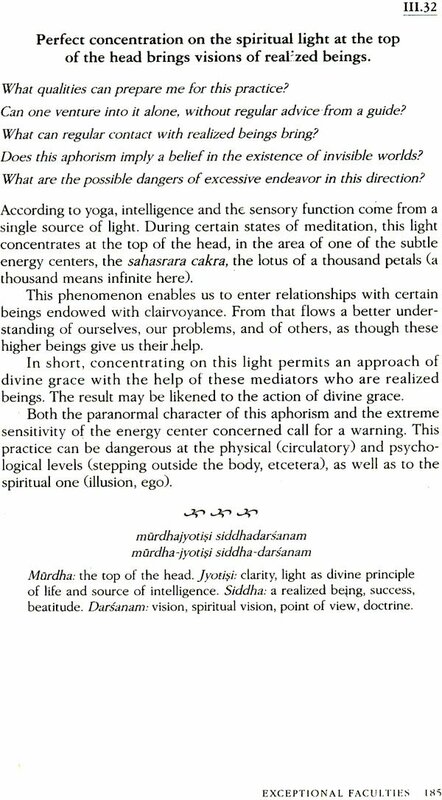 Another problem is seeing Y0ga as a purely esoteric quest, particu- larly due to the difficulty of reading original texts on yoga. In this light, Patanjali's treatise, which is extremely concise, is meant to be commented on and explained during oral exchanges. Its teaching is uniquely adapted to each personality and its semantic richness allows for multidimensional levels of interpretation, but this also can render understanding difficult, especially to nonspecialists. The work presented here attempts to meld precise and simple commentary with personal study, supplying explanations and themes for reflection for each aphorism. This will be most fruitful for readers willing to question themselves. A first reading can open the way; however only discussions in private with an experienced guide can lead to real liberation. The goal of this book is to facilitate the search for inner balance and personal growth through a better knowledge of yourself and your real potential. The emphasis is on using the text to free yourself from past conditioning through self-discovery in the mirror of yoga, which throws a new light on everything. To progress, the individual approach must be daily, long-term, and ever-enewed. Benefits may not be recognized immediately; they may come only after several months, perhaps even years, of practice, study, and persevering reflec- tion. But what joy when the veil is torn from our eyes and we discover real inner freedom! May each reader find in their endeavor the strength and determination to continue on the road to self-liberation.